Tabs on Travel Ltd is more than just a trade press publisher – we are a communications company which specialises in the travel industry. 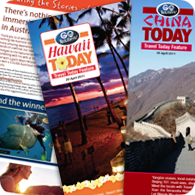 In addition to publishing Travel Today, the leading travel industry trade publication in New Zealand, Tabs on Travel Ltd also offers the travel industry several other specialist publishing, communication and distribution services not offered elsewhere. Travel Today regularly publishes Destinational Features, and other features based around specific tasks such as Product Launches, etc. These are then stored under the Destinational Features pages of this website. Other noteworthy and useful files are ‘parked’ in the ParkingLot. The ParkingLot drop-down menu includes links to several pdf files under several main headings such as: RSVP, ClientMail, t-mail, the Cruise Guide; and ‘other’. 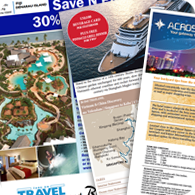 Travel agents will be able to easily find these files which include trade invites and previously-distributed electronic flyers and brochures.